The iPhone 7 is only weeks old, but expectations for what the iPhone 8 will bring to the table are already on their way north, and that trend shows no sign of reversing as we roll forward towards 2017. One of the biggest expectations that has been on many wishlists for some years now is a truly bezel-less display. 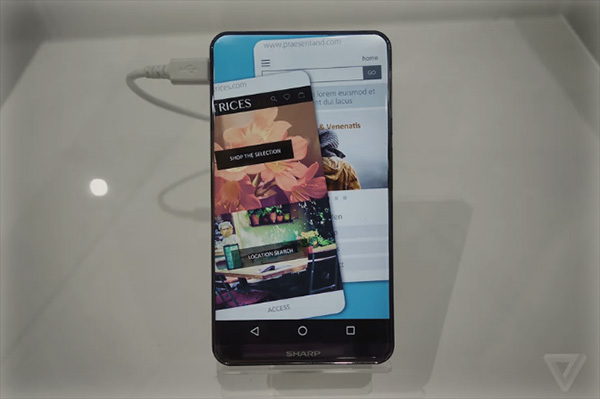 Samsung has already perfected curved screen edges with its own handsets, but many expect, or at least hope, that the iPhone 8 will take things a step further. If those people turn out to be right, the iPhone 8 could be almost entirely made up of screen, and if that sounds impossible, you may want to check out the latest prototype to come out of Sharp, the same display manufacturer rumored to be in talks with Apple over the supply of OLED panels for a future iPhone. Dubbed Corner R, Sharp’s new screen uses Free-Form Display technology, which it says enables IGZO LCD panels to be made into various shapes. Those shapes make panels that bend around edges, including corners, a possibility. 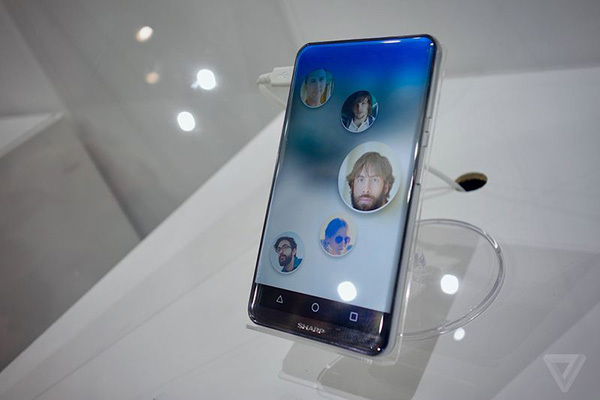 As the photos show, Sharp’s prototype is beyond anything we’ve seen before, and while we’re dubious about its usability, given accidental screen touches would be rife with such a design, the thought of a phone with no bezel whatsoever has us looking forward to the future even more than usual. Sharp’s concept may never see the light of day, of course, but if Apple is looking at squeezing big screens into smaller packages, a curved one such as the one Sharp is now showing off with the Corner R would potentially be just perfect for a future iPhone. Here’s to hoping both Apple and Sharp can get their acts together and make this thing into a real smartphone. We’re happy to never actually use the thing too. We just want to look! Please let 2017 be the year of true bezel-less phones.. PLEASE. When making claims, back it up. There are no claims being made therefore there is nothing to back up. Wouldn’t a customizable bezel defear the purpose of a full screen? Of course, but this option would please all three people. Those that want full display, others who want custom bezels, exactly how they want it, and those who just want the standard bezel set up. Omg that’s genius! I personally hate the screen of the Smaug edge phones, keep pressing the sides by accident and drives me nuts. This solves that problem AND when you want full screen you can opt in for that. That really is the best of both worlds. They’ll try, and then they’ll sue Samsung for having rounded corner displays. This is great and all, but you need bezel for phone cases to protect the phone! My phone’s case wraps the edges and protects the screen from drops. Something I was happy with yesterday when I dropped my phone on to concrete at the pub when I fumbled it out of my pocket! With bezel the case doesn’t interfere with the screen. Hasn’t this article been re-done over and over? Bezels have a purpose and personally, the bezel-less phone looks dreadful, and really hard to use/grip/hold. If you really want a phone without bezels, go get yourself a Samsung Edge.